- Riders at Havana Horses must be at least 4 years old for pony rides and 8 years old for lessons. - Havana Horses enforces a strict weight limit of 80 kilograms for lessons, and 75 kilograms for trail rides, intensive courses and retreats. - Please note that for working with horses and horse riding a good physical and mental condition is required. - All riders ride at their own risk. Visitors agree to hold Havana Horses harmless from any claim resulting from damage or injury caused by horses, owners or guests. - All lessons and lesson packages expire 4 months from date of purchase, or 4 months after the date on the first strip of the lesson strip card. - A lesson lasts one hour, or 60 minutes. A student's lesson starts on its scheduled time whether or not the student is late. - Havana Horses enforces a strict 24-hour cancellation policy. Any student who fails to attend his/her lesson without notice is a "no show" and will be charged the full lesson price. Any cancellation made without at least 24-hour notice will be considered a "no show" and charged the full lesson price. - Havana Horses does not issue refunds. - Proper riding attire - helmet, riding shoes and chaps, or boots - must be worn whenever riding at Havana Horses. - Havana Horses students and staff promote respect and kindness toward humans and horses. - Screaming and running are prohibited. If you bring additional children you will need to have additional guardians present to ensure their safety. - Havana Horses is a riding school and just like a school we will provide a substitute teacher in the event of your instructor's absence. Lesson schedules will proceed as normal without notification to the student unless a time or day change is necessary. - In extreme weather conditions (rain, wind, heat), we offer a variety of alternative lessons including lectures, lessons in our shelter and trail rides. Please consult with your instructor regarding any lesson change. - In case of rain, please call before you come for your lesson or before assuming your lesson is cancelled. It may not be raining at Havana Horses, even if it is raining at your location. Classes are generally held, if at all possible. - Please arrive at least 10 minutes before your lesson to attire yourself with helmet and chaps, and be prepared to spend another thirty minutes to untack and take care of your horses after your lesson. Allow plenty of travel time for our busy Central Java roads. - Groundwork, grooming and tacking are a part of horsemanship and therefore a significant part of your lesson. We are open from 9.00-12.00 and 14.00-16.30. Please take into account that our horses, as well as we, want to rest and eat between 12 and 2 p.m. Lessons, courses, trail rides and/or a natural hoof trim by appointment only. Call, text or email at least 24 hours in advance for your appointment or cancellation. We are closed on Mondays; open on public holidays. You can buy our practical Strip Card with 10 strips and you get 1 for free. One strip equals a one hour lesson or a one hour trail on horseback. This card is personal and must be used within four months after purchase (the date on the first strip). C. Yoga retreat with the focus on natural horsemanship & horse riding: yoga, mindfulness, yoga with, yoga for, and yoga on the horse, communication with the horse, natural horse riding, and trail rides out. Pony Camp Rp 1.750.000 per participant. We organize a Pony Camp of 3 days / 2 nights every 3 to 4 months. Watch our announcements on Facebook! For all horse lovers of 8 years and up! Did you know it is possible to organize a Pony Camp at Havana Horses on request? For a minimum of 6 and a maximum of 10 children of 8 years and older. Just contact us for more info. For working with horses and horse riding wear long comfortable trousers and sturdy shoes, preferably with low heels. Helmets are available. You can buy professional riding gear in Havana Tack Shop. Take a look at this example of our Boarding & Training Contract. Visitors agree to hold Havana Horses harmless from any claim resulting from damage or injury caused by horses, owners or guests, to anyone. Havana Horses is not liable for any injury, sickness, theft or any damage, either physical or material. Please be aware that horses are friendly but large prey animals and behave instinctively. Advance payments made are not reimbursed. CV Havana (Havana Ltd.) is registered under number 503/326/PK/IX/2007 at the Department of Industry, Trade and Investment, Semarang, Indonesia. 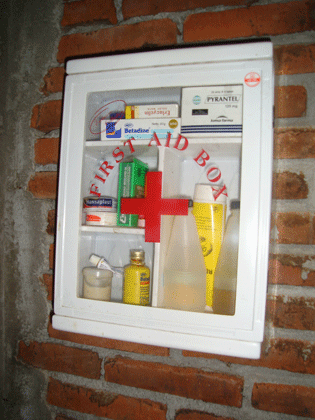 Trained as a nurse, Havedz is qualified for First Aid.